This was written for justgeneration.ca, the forum for youth engagement with the Primate’s World Relief and Development Fund, of which I am a part. The sun was setting as we walked along the road that went up and over the hill. As we wound our way through large, brightly coloured vacation homes, the road slowly deteriorated and gradually the tar turned to a dusty dirt track. Dodging cow droppings in the waning light, my self-imposed mission was to keep my feet as dust and dung free as possible. A difficult challenge given the road. Two-story homes turned to low thatch-roofed rondavels with a kraal (cattle pen) out front. Of course, as I dodged yet another cow wandering free, the cattle weren’t inside the kraal yet. The view from the hilltop was magnificent: to the left, the Indian Ocean stretching out as far as the eye can see; to the right, the Keiskamma River wandering through undulating green hills dotted with coloured thatched houses. It was my last night in South Africa and we were going to watch the football. The weekend before, I had been fortunate enough to road-trip to Port Elizabeth, a large city about three hours south, with three employees/volunteers at the Keiskamma Trust to watch the second night of Africa Cup of Nations action. After much deliberation, we decided to cheer for Ghana’s Black Stars over the rivals from the Democratic Republic of the Congo (DRC). After all, they had done well at the World Cup a few years previously and they had the best souvenirs. No sooner had we put our “I ❤ Ghana” headbands on than we were bombarded for photo opportunities by hundreds of Ghanaian fans, who had made the trip to South Africa. It was a fantastic game and an incredible experience. I caught Cup fever and that is how I found myself climbing up the hill to the other side of the village from where I was staying; to watch the local boys, Bafana Bafana, play a match on one of the only TVs in town. The house with the TV belongs to one of the original community health workers employed at the Keiskamma Trust. The house is currently inhabited by the public health doctor who is living, working, and studying in Hamburg while she facilitates the delivery of health care in the community and surrounding region. 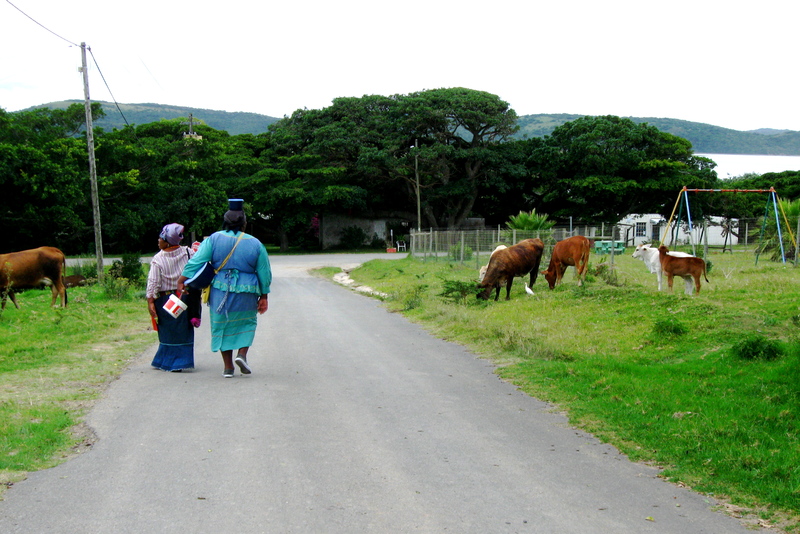 Begun in 2002, the Keiskamma Trust works through a network of community health workers to combat the high rates of HIV/AIDS in their corner of Eastern Cape. The number of stories I heard of people’s lives being changed simply through access to antiretroviral (ARV) medication would be too many to recount here. Stigma is still a difficult thing to overcome and HIV/AIDS is a challenging discussion topic for anyone, yet the Trust has done amazing work in their community. Through funding from PWRDF and CIDA (the Canadian International Development Agency), this work is now being broadened to include psychosocial programs. The psychosocial and health programs compliment the other programs the Trust already runs: art, music outreach, sustainable agriculture, community development, and education. And so the sun went down on my last evening in Africa; I sat outside with friends, new and old, to eat dinner and revel in a South African soccer victory. As we leaned against the side of the hut overlooking the ocean and underneath the stars, I reflected on this community and my connection to it, on the change ongoing in the lives of people there, on the friendships I’d made in two short months, and on how to avoid the cow droppings as we walked the dirt road home in the dark night. This entry was posted in Life and tagged pwrdf, soccer, south africa, travel. Bookmark the permalink.